In 2006, after a decade of working in the northeast with an established stone fabrication company, The Mendez siblings were looking for a little bit of change. Although they weren't sure of where they would land, they knew they wanted to take craftsmanship and an eye for detail with them. Eventually, after an extensive search (and a little bit of help) they found a warehouse company looking to sell, and not just any warehouse, but stone fabricators! Overzealous with finding the opportunity they'd been searching for, they immediately packed all their bags and made their way down to the beautiful City of Oaks. Now, edging ever closer to their decade in business, they couldn't be prouder of their accomplishments especially the recognition and notoriety the company has obtained in the community in not only their skill as fabricators but also their detail oriented customer service. 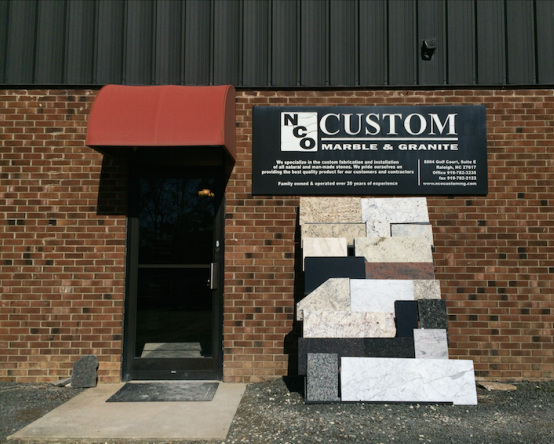 At NCO Custom Marble and Granite, we specialize in the custom fabrication and installation of natural and man-made stone materials. We are a local family owned business with an accumulated 50+ years of experience which prides itself on providing the best quality product and services for our customers and contractors. With the experience, knowledge, and passion they gained from having been in the business for over a decade, The Mendez siblings knew that what they loved to do and were best at doing was custom stone fabrications. With Celine knowing her way around the business aspect and Osbbal's attention to detail and artistry, they knew that they had to continue on bringing that same quality product. However, the business's success comes from not just the mastery of the job, but the love for it as well. So why do we do it you ask, because we love the look on our customers faces when they have exactly what they dreamed of and it's not only done well, but done right! Curious for community feedback check out our reviews here.